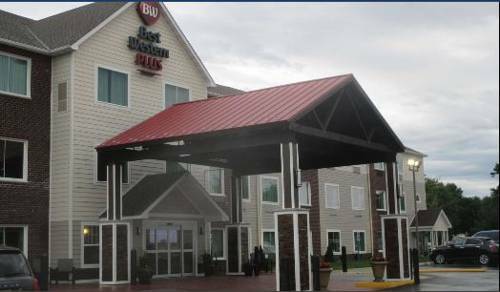 Relax and enjoy comfort at your convenience at this Best Western Plus Menomonie Inn & Suites located in Menomonie, Wisconsin. Whether you are here for leisure or business, let us take care of you. From our complimentary hot breakfast, to our indoor pool, whirlpool, guest laundry facilities, on-site fitness center and agreement with Anytime Fitness, we have you covered. Our free high-speed Internet access allows you to stay in touch with what is important in your life work and home. We are conveniently located just off of I-94, as well as close to the University of Wisconsin-Stout, the scenic Red Cedar State Trail, several restaurants and the Menomonie Industrial Park. Please enjoy our 100% non-smoking, pet-free facility, as you let us show you what Menomonie, WI has to offer. From: I-94 East Bound. Take the WI-25 Exit, Exit 41 toward Menomonie/Barron. Turn right onto Broadway Street N/WI-25. Turn left onto Oak Avenue. The Best Western Plus Menomonie Inn & Suites located on the right hand side. From: I-94 West Bound. Take the WI-25 Exit, Exit 41 toward Menomonie/Barron. Turn left onto WI-25/Broadway Street N. Turn left onto Oak Avenue. The Best Western Plus Menomonie Inn & Suites is located on the right hand side. .3 mile(s) from Stout Ale House, Full Service, American, Open for: lunch, dinner, Enjoy our full menu and bar while relaxing with your friends conversing or catching your favorite game on one of our numerous televisions. Closed Mondays. 2.0 mile(s) from Log Jam Bar and Eatery, Bar/Lounge, American, Open for: lunch, dinner, Stop in and enjoy this locally owned bar and restaurant located in downtown Menomonie. Hours of Operation are: Everyday 11:00 a.m.- 2:00 a.m.
3.1 mile(s) from Cancun Mexican Grill, Fast Food, Mexican, Open for: lunch, dinner, Hours of Operation are: Monday- Saturday 11:00 a.m.- 10:00 p.m. Sunday 12:00 p.m.- 9:00 p.m.
.8 mile(s) from Los Cabos Mexican Grill, Fast Food, Mexican, Open for: lunch, dinner, Hours of Operation are: Monday-Friday 11:00 a.m.- 10:00 p.m. Saturday 11:00 a.m.- 11:00 p.m. Sunday 11:00 a.m.- 12:00 a.m.
1.4 mile(s) from Zanzibar Restaurant & Pub, Full Service, International, Open for: dinner, Enjoy their diverse cuisine and specialty cocktails located in the heart of downtown Menomonie, WI. Hours of Operation are: Tuesday Saturday 4 p.m. to close. 2.0 mile(s) from Acoustic Cafe, Cafe, American, Open for: lunch, dinner, Enjoy the great atmosphere in this locally owned sandwich and coffee shop. Hours of Operation are: Monday-Friday 8:00 a.m.- 9:00 p.m. Saturday-Sunday 9:00 a.m.- 9:00 p.m.
1.0 mile(s) from Menomonie Family, Cafe, American, Open for: breakfast, lunch, dinner, Restaurant. Enjoy our relaxed atmosphere and family-friendly cuisine. Hours of Operation are: Everyday 6:00 a.m.- 8:00 p.m.
2.1 mile(s) from Toppers Pizza, Fast Food, American, Open for: lunch, dinner, Hours of Operation are: Everyday 10:30 a.m.- 3:00 a.m.
Across the street from Denny's , Full Service, American, Open for: breakfast, lunch, dinner, Hours of Operation are: 24 hours, 7 days a week. Pool - Indoor pool Heated Indoor pool and whirlpool are available on property and open all year. Hot tub - Hot tub Indoor pool and whirlpool are available on property and open all year. 1.0 mile(s) from Vets Plus, Inc.
3.2 mile(s) from Menomonie 7 Theatre, grab some popcorn and catch the latest blockbuster at Menomonie s local movie theater. 1.8 mile(s) from Mabel Tainter, this castle-like theater, originally constructed in 1889, has been named one of the world s most spectacular theaters by CNN and is home to the local arts scene, including a popular arts and crafts fair. 9.0 mile(s) from Empire in Pine Museum, step back in time to explore Dunn County s historic logging industry. See daily life in a logger s and stone quarry worker s camp, and then visit the vintage jail and post office. 3.1 mile(s) from Chippewa Valley Golf Club, work on your swing at this scenic 18-hole course featuring beautiful lakes and mature trees. 2.5 mile(s) from University of Wisconsin-Stout, enrolls more than 9,000 students and offers more than 70 undergraduate and undergraduate degrees, with a special focus on industry and technology. .3 mile(s) from Shops Off Broadway, spend an afternoon shopping at this popular retail center, then enjoy a few games of bowling before ordering dinner at Stout Ale House. .5 mile(s) from Red Cedar State Trail, explore the beauty of western Wisconsin first-hand on this 14-mile trail that s ideal for walking, bicycling, snowshoeing and even kayaking. Indoors, the size 638-D boot is the star exhibit of the Red Wing Shoe Museum. Weighs over a ton and is "too big for the Statue of Liberty to wear." Not that she would.